Discussion in 'General Dog Forum' started by merlina, Feb 14, 2019. 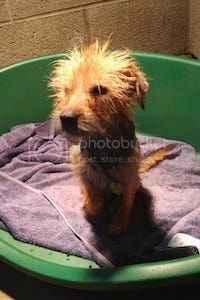 This little scrap arrived in rescue today. Nearly bald and emaciated, she's 'friendly, lively and affection.' What's wrong with humans? Poor girl. At least she has hope of a brighter future. Is it your rescue? No- I only do actual hands-on with rescue horses now. But she's with Rochdale Dog Rescue that I support and do homechecks for, among others. I've seen worse to be honest- this just struck me because I'd posted on the light-hearted thread about having your dog dyed with zebra stripes etc. It seemed a stark contrast! And yes, they will find her a good home. They are one of the best dog rescues I know of. Will you be able to update us on her progress? JoanneF and Ragsysmum like this. That's horrible pictures like this make me cry, poor little soul. Some people don't deserve animals if you don't love them don't buy them. I hope she finds someone who will love her. 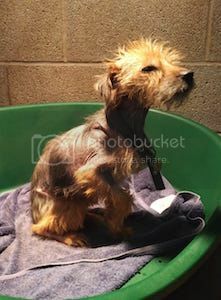 First I do not know this little ones story so I am not saying its the same, but it is possible it wasn't the owners fault. Years ago we took in a very underweight Whippet, the vet gave him a 50:50 chance. He lived with another dog and an old chap. The chap didn't have any family, he developed dementia. The local council arranged for carers to visit him, they fed him etc but didn't do anything about the dogs. Fortunately the dementia was rapidly progressing so it was decided to move him into a nursing home. They arranged for the dog warden to go with them when he was moved, she gave the carers a piece of her mind rushed the dogs to a vet. The other dog was considered to bad so was put down, my wife got a phone call asking if we would take the Whippet in as being in a home would give it the best chance. So she thought long and hard, (like for about 1/2 sec), said yes so he came to us. As far as we could tell the dog had previously been well looked after and when he got fitter it was obvious that he trusted humans. So as I wrote its possible this dogs owner was not at fault. Ragsysmum, leashedForLife, JoanneF and 1 other person like this. I do have to agree, even knowing there are some pretty awful people out there without a doubt, but my first yorkie I adopted at 12years old, the first time I picked her up I was expecting some weight but she was like a feather and rag taggy.. Her elderly owner had died and she was not found for nearly a week with her dog... pretty sure they had been struggling together a long time before that too.. Really sad.. But I'm not denying the fact that most cases are down to wanton neglect and cruelty. Hope that little one finds a lovely home soon.. Mm...I make sure never to ask the background unless it impacts on the future home, which she won't be getting soon because it will take a long while- and big vets bills. The rescue, like all good rescues, will want her fit as they can get her. I'm cynical these days- there's so much help around from PDSA, Blue Cross etc and other charities that will take animals before there's suffering involved- so much information available. But she will get rehomed quickly if she gets well. It's poor little bitten to pieces staffies that have the longer wait. I'm a little bit reluctant to ask but is this about dog fighting? Staffies in rescues break my heart as they so can't handle the kennel environment on top of whatever trauma they have been through.. I saw a saying once that sums them up to me and it was 'The biggest muscle in a staff is their heart...' A mate of mine has just adopted a 7 year old one who has had many homes before her and she is gorgeous, obviously has some issues but my mate and her family are devoted to her and working through them, I've been doing some reiki work with her too which she has been loving.. .. wish more good people would adopt staffs, they so desperately need it. leashedForLife, Ragsysmum, JoanneF and 1 other person like this. Oh, I cannot 'like' that @Kara 1 but poor, poor lad. Thank goodness he got into rescue. Yes- the most abused breed! And can be the sweetest. My daughter had a staffy. So gentle and caring she even nurtures the kittens.Diva was 18 months old when my daughter got her and her two youngest were 2 and 4. I was horrified a staffy with small children. That was nine years ago. She iis old now but still so loving. leashedForLife, Flobo and merlina like this. A couple of pics of my daughters staffy, Diva. A mum to Dudley when he was little and a lovely foster mum to the kittens. leashedForLife and merlina like this. Flobo and JoanneF like this.